Hummingbird feeders always attract a crowd of eager hummingbirds. It’s always a special thrill to see a hummingbird gracing your yard – a thrill and joy that we bird lovers never tire of. In fact, every time I see a hummingbird, it’s as though I’m seeing one for the first time. There are a great number of hummingbird feeders on the market and many are so beautiful, bird lovers eagerly hang several around their yard. 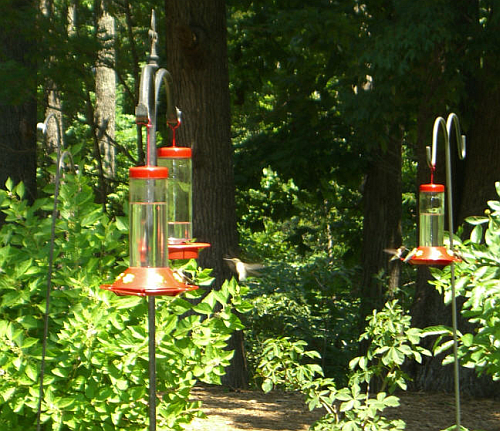 We have a bright, colorful hummingbird feeder at one of our bird feeding stations. I actually wish that it were hanging in a different spot, but one of the first rules of feeding hummingbirds (and attracting them again and again) is this: Don’t move the feeder around! The little beauties expect their feeder to be exactly where they left it – not just day after day, but year after year. It’s a sure bet that I won’t be moving ours any time soon. The reason I’m tempted to relocate this hummingbird feeder has to do with a magnificent flower (in the form of a hanging plant) – the beautiful Mandevilla. I’d love to hang our Mandevilla in the spot currently adorned by the hummingbird feeder. You see, this particular bird feeding station is set up in perfect view from a window by my computer desk. It’s also in full view of the windows I look out while fixing supper. Our hummingbirds like this bird feeder – but they LOVE the Mandevilla! However, from where the magnificent Mandevilla hangs, you can only see it (and the hummingbirds who adore it) while you’re outside. I guess I was wanting more of a front row seat for the party. However, as any bird watcher and bird lover worth their salt knows – in the end, it’s not about the watcher, it’s about the watched. The birds’ happiness, safety, and convenience win out over my entertainment. The feeder stays where it is. Hummingbirds are most attracted to red, tubular flowers but they will (make no mistake about it) visit other colored flowers as well. We have gorgeous purple petunias that hummingbirds seem to love. Just last evening I watched as a hummingbird dove right into the midst of 8 butterflies – all seeking sweetness from the same purple petunia…. never mind the fact that the flower bed’s filled with flowers and never mind the fact that there were about 6 other petunia plants just like this one. The hummingbird and butterflies were convinced this was the best flower of the bunch. Who am I to question, maybe it was! For the best results – and to attract gorgeous butterflies to your yard along with hummingbirds (and finches, orioles, cardinals…), plant a wide variety of flowers of all colors. You’d also be wise to hang several hanging baskets of flowering hummingbird favorites. Not only do we have several flower beds to lure our colorful friends, we have many potted flowers, potted plants, and hanging baskets as well. Variety, variety, variety! The best time to put out a hummingbird feeder is early spring – but I’ve put hummingbird feeders out as late as August with great success. Then again, the little visitors were already familiar with the flowers on our menu. You’ll want to clean your hummingbird feeders regularly, though. This is very, very important. Hummingbirds could actually be harmed by funky, old sugar water. Mix 1 part white sugar with 4 parts water and boil for 1 to 2 minutes. Boiling will retard fermentation. Cool the mixture completely – test it with your fingertip. For those completely unfamiliar with the kitchen, 1 part to 4 parts simply means if you’re using 4 cups water, use 1 cup sugar… 2 cups water, 1 cup sugar..
After the mixture is completely cool, fill your container(s). If your hummingbird feeder already has red on it (and most do), you really don’t have to worry about adding red food coloring. However, it won’t hurt your little guests if you do. I prefer to provide our hummingbird guests with as many flowers as possible AND an ever-available feeder. Even when the yard is filled with beautiful, open, inviting flowers, our hummingbirds will still visit their hummingbird feeder eagerly. Attracting hummingbirds is like attracting any sort of bird (or butterfly). You have to think like they do! What they’re drawn to is red. What they love is sweetness – sweet nectar or sugar water. They also love the insects they find inside tubular flowers. But there’s very little you can do about that. A word of caution: Please be very careful what sprays, potions you use on or around flowers and plants. We use absolutely nothing on any of our flowers, vegetables, and plants. Why take chances on harming an innocent bird or animal that’s honoring you by being a guest. Best of luck in your bird watching endeavors and I hope your yard will soon be filled with hummingbirds! If two cups of water, then 1/2 cup of sugar. My sister in Indiana discovered a plant that originates in Mexico that attracts hummingbirds more than any other plant that I know, which is called a shrimp plant. Google “shrimp plant” and you can see what it looks like. I hope that it becomes popular, because I can’t find it anywhere around here in NC. Thanks for the tip, Karen! I’m going to have to look for it – I’m obsessed with hummingbirds and if they like a particular plant, I’m going to move Heaven and earth to find it!